Here's the next three pages of my journal. I think the Larkspur has a magical feel so for July I added some sparkle! To make this page I cut two rectangle of white card using one horizontally and the other vertically I stamped the Larkspur in brown and blue across the bottom and up the side. On the vertical one stamp "Larkspur" in the top right hand corner and a butterfly from the Butterfly Background (ref: 0604066A) fluttering near the Larkspur. 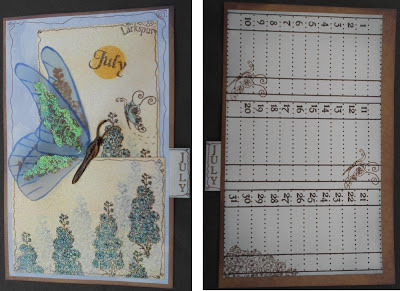 Next I punched a circle out of a scrap piece of paper for the sun and inked it in and stamped "July" over it. To finish them off I coloured in the brown stamped Larkspurs, distressed both rectangles and doodled around the edges. I then embossed them and attached them to a piece of blue backing paper. For the butterfly I used a Dimension Stamps stamp set called Vintage "Fluttering Flourishes" (ref: 2400063a). I stamped the butterfly twice onto blue velum and then the body onto Kraft card. Onto the wing I stamped the Larkspur. Once these were dry I cut them out (you only need the left wings from the butterfly!). These were then attached to the page and stickles and Glossy Accents were added to the butterfly. For the calendar I stamped the Larkspur in the bottom corner then stamped a couple of butterflies. Then lightly distress the edges. This picture isn't the greatest! August page was really quick to do. 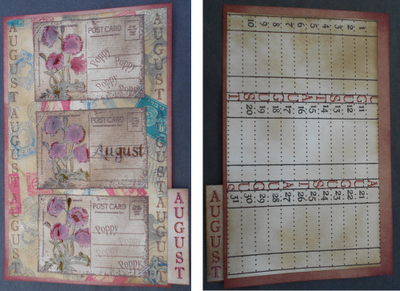 I found some postal backing paper, cut it down to size and stamped "August" down the two edges, this was then distressed. I then stamped the Postcard (ref: 1808010A)﻿ three times, then masking off the left hand side I stamped the Poppy then on the left hand side I stamped "August" on one and "Poppy" on the other two. These were then coloured, distressed and cut out. The postcard's were then attach the the backing paper then stapled in place. To finish off I added Glossy Accents to the Poppies. 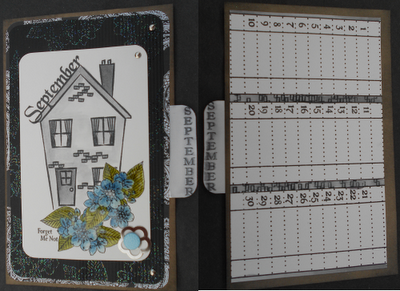 For the calender part I masked of the grids and stamped "August" between them, then lightly distress it. I just love using the postcard stamp as it seems to work really well for those blokes cards. For Septembers page I used Octobers fantastic project club set and tried to recreate a card I made a while ago as a 60th Birthday card. To make this one I stamped the Forget Me Not in the bottom right hand corner masked it and stamped it again and added "Forget Me Not" next to them. Then masking both of the stamped flowers I stamped the house, added some bricks and "September" along the roof. I then coloured in the flowers and the house. 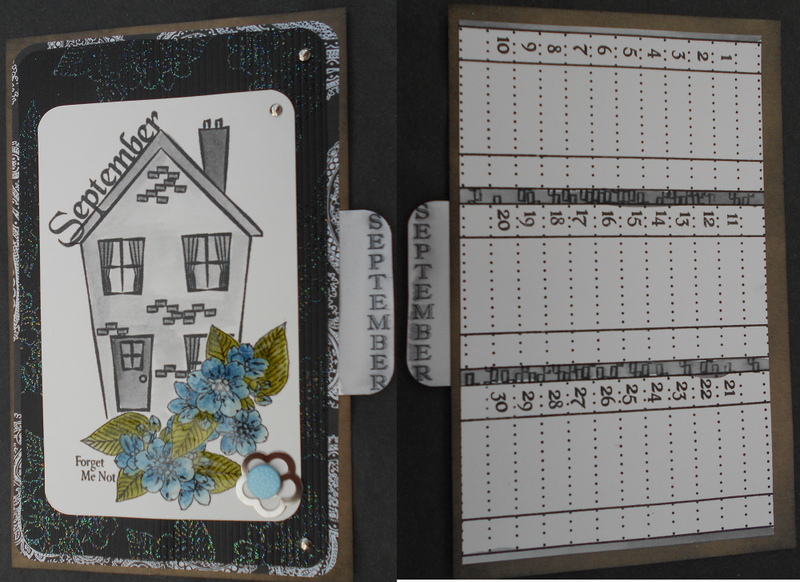 Next I cut some black card for the background, then stamped and embossed the Forget Me Not. This was then attached to some patterned paper. Finally I added some brads to the corners. For more information on the Dimension Stamps Project Club please visit their website.